The BIM2/3G data radio module is a PLL synthesiser based miniature PCB mounting UHF radio transceiver which enable the simple implementation of a wireless data link at up to 128 kbps at distances up to 75 metres in-building and 300 metres open ground. BiM2A is half-duplex crystals controlled PLL wideband FM transceiver operating on 433.05-434.79MHz European SRD band. 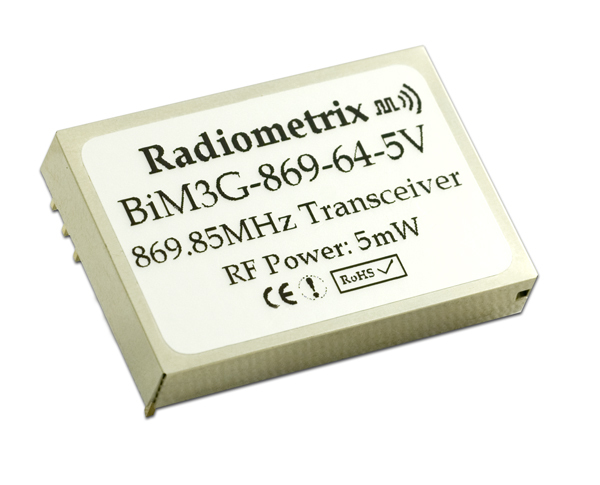 The BiM3A radio transceiver module is similar in size and pinout to the BiM2, offering all the advantages of the latter but with reduced power consumption and antenna size. The BiM3A replaces the obsolete BiM3. Enhanced high power replacement for BiM3A-869-64.